Star Trek: "Where No Man Has Gone Before"
Growing up, I didn't have a lot in common with my dad. He fixed copiers and was good with his hands; I played video games and had a hard time remembering my left from my right. Plus, he was into sports, and I didn't really give a crap-I've tried to watch football, but it always seems like the waste of a good nap (although given how often I've seen Dad fall asleep in front of a game, I guess he agrees with me). Fishing was okay. Boring, but okay, and apart from getting the worm on the hook, the mechanical demands were so limited that even I had a hard time screwing them up. But you can only fish so often in a year, which means there were all these months we'd be related to each other, but still have nothing to do. As for the movies, I've seen more of the Highlander franchise than any sensible person should, but the films we watched the most came from Star Trek. Dad took me to see parts four and five in theaters, we had a tape of Wrath of Khan from off broadcast TV that I must've played at least fifty times, and then there was the series that started it all. When I was a kid, The Next Generation was just coming into prominence, but the original show was still in syndication. So every Saturday night, 'round five-ish, we'd move the kitchen table so we could all see the television, and over franks and beans (bleargh), the whole family would watch Captain Kirk, Spock, Sulu, and the rest, warping around the galaxy, busting expensive computer equipment, and generally getting up in everybody's business. 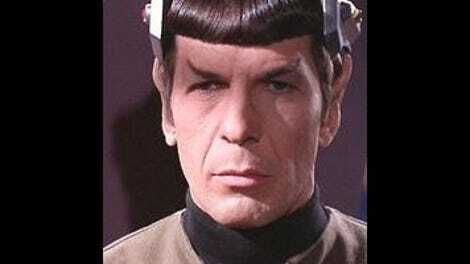 Trek has come a long way from bad toupees, plywood plants, and rubber monsters. Gene Roddenberry's half-baked ideas have rattled through the collective unconscious for so long they seem nearly profound, and the cast members have all passed from characters to icons to self-parody to-something else. These days, even people who've never seen an episode know what the Enterprise is, and for the obsessives, there are the endless tie-ins and spin-offs, including four follow-up series, a ten movie franchise, and a reboot film from J.J. Abrams that's set to hit theaters this summer. The whole thing has transcended its roots to become cultural, mocked by the skeptical but impossible to dismiss completely. But what about the actual show? Running just under eighty episodes in three seasons, it would be reasonable to assume that Trek has long since been over-shadowed by its own success; but watching it today, it's still easy to see what got people so excited in the first place. There's a pulpy vitality to the series that no amount of franchise ennui can destroy, the thrilling, endlessly enthralling feeling of making-it-up-as-you-go. As a kid, I got hooked at first because my dad liked it, and because the aliens were cool (to an eight year-old, the Horta is freaky as hell-it looks like burnt pizza, only it can melt your face off). But strip away the history, ignore the baggage, and Trek remains a terrific piece of work. Not without its share of flaws, and we'll get to those; but this is pop culture art, and at its best, transcends the campy effects and over-acting to create a universe well worth visiting. "No Man" introduces one of Trek's most oft-recurring villains: a being gifted with incredible powers who lacks the judgment or maturity to know how to use those powers wisely. When the Enterprise encounters a strange force field at the edge of the galaxy, helmsmen Gary Mitchell (Gary Lockwood) and psychiatrist Elizabeth Dehner (Sally Kellerman) get walloped by a blast of cosmic energy that gives Gary some freaky (and really painful looking) silver contacts, but leaves Elizabeth initially unaffected. 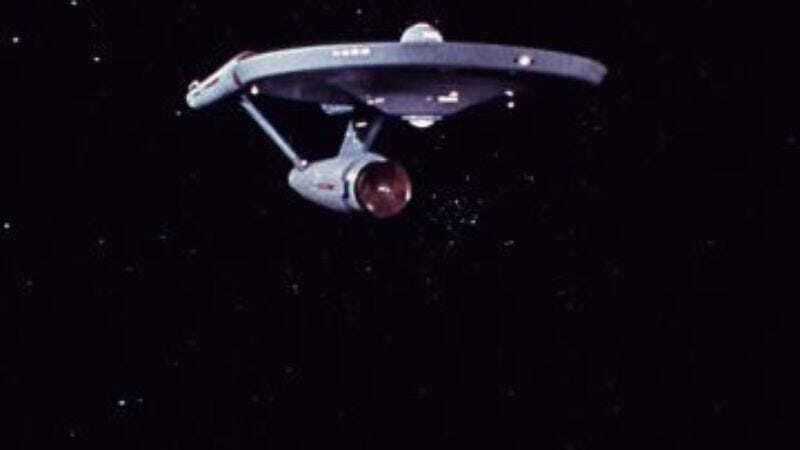 Before encountering the field, the Enterprise recovered a black-box type recording from the missing SS Valiant, and as Gary develops increasingly unnerving powers (including speed reading, psychic abilities, and Trumpy's knack for doing magic things), that recording provides the only clues as to what comes next. The Valiant, it seems, had its run in with the force field, and as far as Spock can tell, when one of its own crew started making rapid jumps up the evolutionary ladder, the captain of the ship ordered a self-destruct. So the question isn't what's happening to Gary as much as it is, what does that mean for the rest of us? Spock, always the reasonable one, advocates marooning the freak, or else killing him while they still can, but Kirk goes all Hamlet and starts in with the hand-wringing. Given his friendship with Gary, will he make the right choice-if there's even a right choice to be made—and can he do it before it's too late? Like a lot of pilots, "No Man" is most interesting for what it lacks. Much of the cast is already in place, including James Doohan at Engineering and George Takei, but instead of DeForest Kelley as Dr. McCoy, we've got the genially dull Dr. Piper (Paul Fix) in Sick Bay, and there's no Uhura in sight. The production design isn't quite finished yet, either; the show's look was always more about impressions (and thrift) than functionality, but that bridge looks awfully empty, and the brown sweater-shirts that Kirk, Spock, and a good portion of the crew wear are depressingly flat and washed out. As for the episode itself, it drags in places, and spends more time with Gary and Elizabeth than it really needs to-inevitably Elizabeth starts developing her own mental hoodoo, and there's only so much "Come with me and we can rule the galaxy as dude and dude's sort of girlfriend" dialogue you can take before it gets dull. The sexual politics are hilariously (and embarrassingly) dated, but we'll save that for another installment; suffice to say, Elizabeth's "Women professionals do tend to overcompensate" is not meant ironically. To a modern audience, raised to expect a certain degree of realism in its genre offerings, "No Man"'s approach is exceedingly simplistic; the force field at the edge of the galaxy is about as blatant as sci-fi MacGuffins get, and there's no effort made to explain why Gary gets so powerful so fast, apart from his high ratings as an "esper" (the ep presumes the existence of ESP, a development I can't remember ever coming up again). Plus, the speed with which the crew jumps from, "Hey, Gary's okay!" to "Hey, we need to kill Gary!" is remarkably fast. No one ever discusses trying to reason with him, or cure him; odds are neither would've worked, but just skipping to the end is a bit like cheating. But that might be missing the point. In addition to giving Gary and Elizabeth The Touch, the magic force field also wrecks the Enterprise's engines, making the nearest star-bases "years in the distance" instead of just weeks. The engine problems are ultimately fixed without a whole lot of hand-wringing, but that one line, and all the weight behind it, throws the rest of the episode into sharper focus. One of the things that makes the original Trek so exciting to watch, for all its clumsiness, is its sense of dangerous exploration; the whole thing is run without a safety net, and every decision becomes life and death, filled with consequences impossible to foresee, let alone plan for. The spin-offs would have better effects and better attention to detail, but none of them ever captured the original's knife's edge intensity. It's a show of over-sized emotions, and often all the crazy hormone-driven monologues skirt close to camp; but maybe those passions aren't that unreasonable, given the circumstances. By the end of "No Man," Kirk is forced to decide between loyalty to his friend and loyalty to his ship, and to no one's surprise, he chooses the latter; for all the jokes about his libido, Kirk's only true love is the Enterprise, and along with his friendship with Spock, it's the character's defining trait. So we get some decent cat-and-mouse stuff, with Kirk attempting to strand Gary on a human-free mining planet before realizing that, given Gary's exponential development, that might not be a wise choice. Gary kills a crew-member and forces Kirk to follow him and Elizabeth out into the planet's soon-to-be-very-familiar rocky landscape. While G and E get their god thing on, a hopelessly outmatched Kirk stalks them with his laser rifle; all appears lost, but in the final scenes, Kirk manages to remind Elizabeth of her obligations to humanity, and the whole thing ends with a charmingly goofy fistfight between man and Superman. In some ways, this is an awkward episode, bridging the gap between concept and what the series would ultimately become, but it's not without its charms. And for whatever it may lack, "No Man" does have, at its heart, what would be Trek's biggest concern: the lure of unknown, and how we deal with what we find there. It also has pointy ears, plastic plant-life, and clumsy brawls on less-than-sturdy sets. As any dad could tell you, those are pretty important too. —In the upcoming months, I'll be covering the rest of the first season, and hopefully beyond; I'd also like to throw in a few of the movies—at the very least, a "Space Seed"/Wrath of Khan double feature seems essential. See you next week!